A very high specification with a trapezoid polycarbonate lens shape, guaranteeing maximum field of vision. The nylon frame gives protection from below and from the sides. 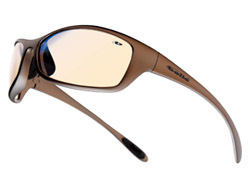 The glasses also have TPE inserts for additional comfort around the nose and ears. All this and weighing in at only 26g! Optical Quality 1 lenses are standard in this range and the clear lens include anti-dust, anti-scratch and anti-static coatings. 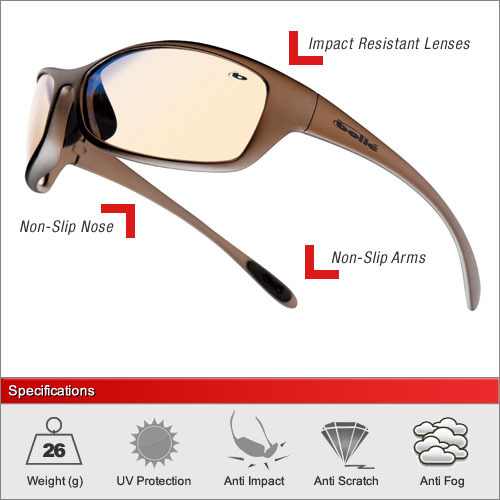 Due to the special treatments of the ESP and Flash lenses they are not anti-fog treated. Each pair is supplied with a MicroFibre pouch as standard for storage and cleaning. We have 3 lenses available in this frame. The clear lens for 100% optical quality 1 performance and maximum clarity. The ESP lens for reducing harmful blue light and reducing glare and finally and Flash lens for full solar protection including additional Infrared protection.